How Many Choices Do You Still Have for Fiber Patch Cable? Fiber patch cable, also known as fiber jumper, is a key component in today’s fiber optic network. They play the role of veins in the whole fiber optic network bringing fiber optic signals between devices. How to Select Standard Fiber Patch Cable? What’s the fiber type of the patch cable? The available selection are Multimode (OM1, OM2, OM3, OM4) and single-mode (OS1 and OS2). What’s the connector type and connector polishing type on the two ends of fiber patch cable? Currently the most commonly used fiber patch cables are usually terminated with LC, SC and MPO connectors. What’s the fiber count of the patch cable? Simplex (one fiber) and duplex (2 fibers) fiber patch cable are very common. 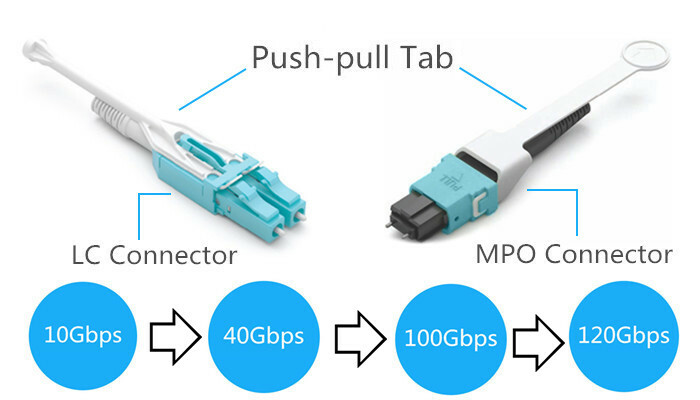 For fiber patch cables terminated with MTP/MPO connector or breakout fiber patch cables. Their fiber count would be larger, sometime up to 24 fibers or more. What’s the material of the fiber patch cable jacket? PVC, LSZH, Armored, and OFNP are the choice of most situations. Now with the fiber optic cable being widely used in a variety of industries and places, the requests for fiber patch are being refined. Fiber patch cable are being required to be improved and provide more possibilities to satisfy various application environments. Actually, many specially fiber patch cable have been created to answer the market call. Here will introduce several unique but useful fiber patch cable for your references. Bend loss issues are always a headache problem for most fiber optic network designers and installers. Why? Cause signal loss caused by bend loss issues are really hard to handle. In addition the bend loss issues are difficult to locate. That’s why bend insensitive fiber patch cables are created. Literally, it tells us that this type of fiber patch cable is not as sensitive as other fiber patch cables. The secrets is lays on the fibers which is made of bend insensitive glass. More and more data centers and FTTH systems are tend to use these bend insensitive fiber patch cables, because they do not provide lower signal loss, but also provide a much more durable and easy to maintain networking environment. Fiber optic installer is able to save installation cost with faster installation due to easier fiber optic cable handling. Keyed LC fiber patch cable, is also called secured LC fiber patch cable. This is because, the fiber optic connectors on the two end of the patch cable are specially designed LC connectors, which can ensure the data security at the mechanic level. Keyed LC fiber patch cable is identifies by the connector color. 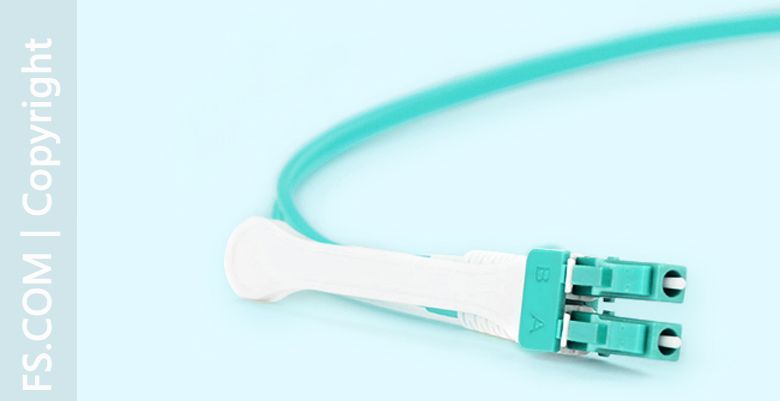 Keyed LC fiber patch cable is just a part of the Keyed LC connectivity product family. It should be used with the same colored fiber adapters or fiber adapter panels. Each color of a set of keyed LC connectivity products represents a unique keying pattern that only allows matched color mating. 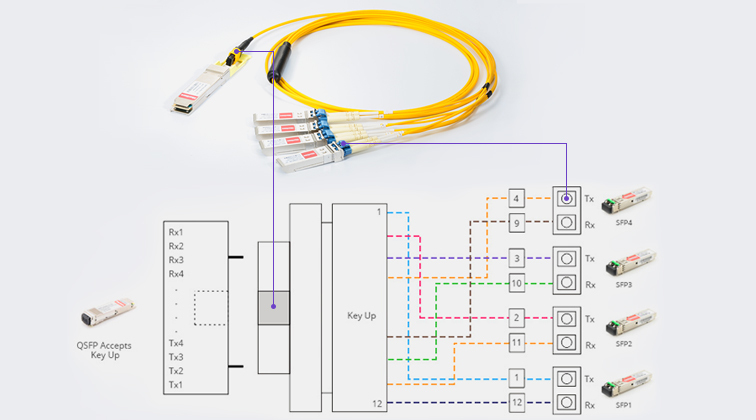 This is how keyed LC fiber patch cable can provide data security for fiber optic network. A previous article (Secure Fiber Optic Link With Keyed LC Connectivity Products) of my has introduce keyed LC connectivity in details, kindly follow the link on the article title if you need more information about them. Uniboot LC fiber patch cable is a fiber patch cable with two fibers wrapped in the same strand of cable. 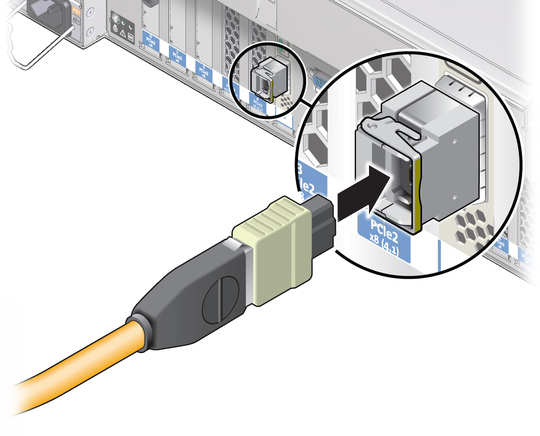 A duplex LC fiber optic connector which can provide easy polarity reversal is terminated on each end of the uniboot LC fiber patch cable. The following picture show the polarity reversal of a typical uniboot LC fiber patch cable. With less cabling space are require, better cooling is available. With easier polarity reversal, no additional tools are required. And easier cable management can be enjoyed. HD (high density) TAB fiber patch cable is a fiber patch cable with its connectors attached with a push pull tab, which can provide easier finger access and cable locating. Today’s fiber optic network is increasing depended on high density which results in difficult finger access and difficult cable management. With a push-pull tab attached on the connector, problem are solved easily. The connecting and disconnection of fiber patch cables will be easier without affecting other surrounding links. Currently most HD TAB fiber patch cables available the market are terminated with LC and MTP/MPO connectors. For more information about this type of patch cable kindly visit my article: Cabling With High Density Push-Pull Tab Patch Cords. HD uniboot LC fiber patch cable combine the advantages of uniboot LC fiber patch cable and HD TAB fiber patch cable. 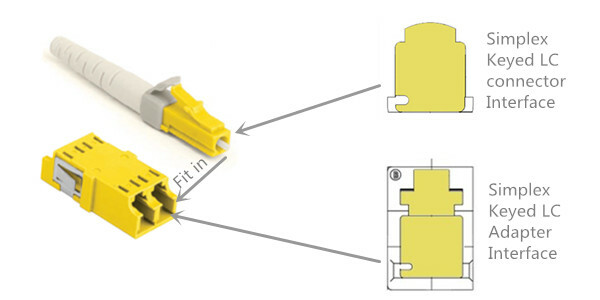 Combining two optical fibers in a single cable strand and attaching a push-pull tab on the connectors, HD uniboot LC fiber patch cable can minimize the required cabling spaces to extreme. It is an ideal solution for high density cabling environment. Except the standard fiber patch cable, there are still a lot of choices which can meet the requirements of various networking environment. 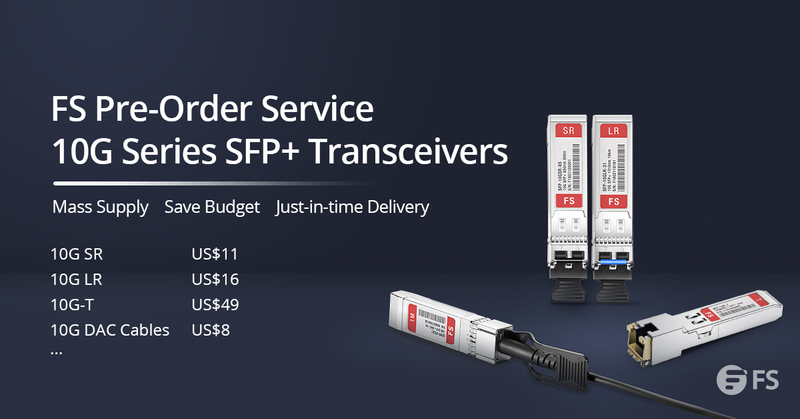 All the above mentioned fiber patch cable are all available in FS.COM. Kindly visit FS.COM or contact sales@fs.com for more details. This entry was posted in Fiber Cabling, Fiber Patch Cable, Network Solutions and tagged bend insensitive fiber patch cable, Fiber patch cable, keyed LC fiber patch cable, uniboot LC fiber patch cable on June 27, 2016 by Alice Gui. Deploying more fiber optic cable is just the first step to meet the high-bandwidth requirements, strong management over the fiber optic cable is a basic requirement for a successful fiber optic network infrastructure. Fiber patch cable might be the weakest link in optical network infrastructures. To deliver and guarantee and optimal network performance, patch cable management is critical. In addition, cable management of optical fiber can lower operation cost & time and increases the reliability and flexibility of network operation and maintenance. This post will offer the critical elements that should be noted during patch cable management, as well as tips for fiber patch cable management. To get a flexible and well-organized patch cable management, the factors that affect the performance of the fiber optic patch cable should be introduced first. Here are four key elements that should be considered during patch cable management. Unlike copper, fiber optic made of glass is much fragile and need more protection and attention during the operation and management. Thus, the fiber’s bend radius will impact its reliability and performance. If a fiber cable is bent excessively, the optical signal within the cable may refract and escape through the fiber cladding which will cause a loss of signal strength and is known as bend loss. What’s more, bending, especially during the installation and pulling of fiber optic patch cable might also cause micro cracks and damage the fiber permanently. Generally, there are two basic types of bends in fiber, which are microbends and macrobends as shown in the following picture. The macrobends are larger than microbends. What should be noted is that bend radius might not be seen during the initial installation of fiber patch cable. This is because the number of patch cables routed to the optical distribution ODF is usually small. However, when more patch cords are added on the top of installed patch cables in the future the problems will come across (shown in the following picture). A fiber patch cable that working fine for years might suddenly have an increased level of attenuation, as well as a potentially shorter service life. Patch cable path is an aspect closely related to bend radius that can affect the performance and maintenance of the patch cable. The path of the patch cable should be clearly defined and easy to follow. Improper cable routing can cause increased congestion in the termination panel, increasing the possibility of bend radius violations and long-term failure. However, the well-managed patch cable path ensures that bend radius requirements are maintained at all points and makes accessing individual patch cable easier, quicker and safer. What should be mentioned is that the well-organized fiber patch cords can help to decrease operating costs and the time required to turn-up or restore service. The third aspect is the accessibility of the installed patch cable. If the installed patch cable is easy to be accessed, the maintenance and operation would be quick without inducing a macrobend on an adjacent fiber, and it can also offer proper bend radius protection. Accessibility is critical during network reconfiguration operations and directly impacts operation costs and network reliability. Patch cables routed between pieces of equipment can largely affect network reliability. Without proper protection, they would be easy to be damaged by technicians and equipment accidentally. Thus, physical protection of the installed patch cords is very important. According to the mentioned aspects that can affect the performance and maintenance of the fiber optic patch cable, here offers several tips that can help to increase the performance of patch cords, as well as the reliability and flexibility of patch cable management. Tip 1: Pay attention to the bend radius of the patch cable. Generally, for 1.6mm and 3.0mm cords, the minimum un-loaded bend radius is 3.5 cm, and the minimum bend radius of MPO patch cable is ten times the cord diameter. Tip 2: Never pull or stress the patch cords (shown in the following figure). During the patching process, excessive force can stress fiber patch cables and connectors attached to them, thus reducing their performance. There might be something wrong if you need to use force in pulling a cord. Tip 3: Routing cords through cable pathways. If the existing cord is the right length, it may be possible to re-use it. If this is the case, remove the cord completely and re-run it in through the cable pathways. This is the only sure way to ensure there are no tangles, kinks or strains in the cord. For efficient routing, find the best path between the ports to be connected. Avoid routing cords through troughs and guides that are already congested. Tip 4: Bundling and tying cords give the panel a neat appearance but tight bundling increases the risk of pinching (as shown in the following figure). Do not tighten cable ties beyond the point where individual cords can rotate freely. Tip 5: Labeling is necessary. Labeling is the most important part of a System Administrator’s responsibilities. At any administration point in a cabling infrastructure, including patch panel, accurate labels are essential. These will identify pair modularity and tell technicians where the other end of the cable is terminated. Tip 6: Inspect fiber cords for physical damage including stress marks from sharp bends on the sheath, or damage to connectors as shown in the following figure. A strong and successful patch cable management which can increase the reliability and flexibility and decrease the cost of network operation and maintenance should provide bend radius protection, reasonable patch cable path, easy accessibility of patch cable and physical protection. When the four mentioned aspects are satisfied, there is already half the success of strong patch cable management. This entry was posted in Fiber Cabling, Fiber Patch Cable and tagged bend radius, Cable Management, Fiber patch cable, fiber patch cable management, fiber patch cord on December 14, 2015 by Alice Gui.